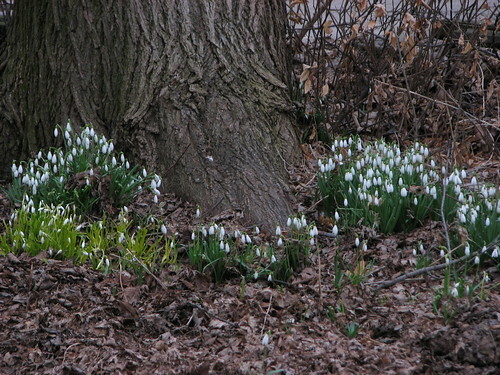 Your snowdrops are lovely, and they'll take encouragement and inspiration from your neighbour's. 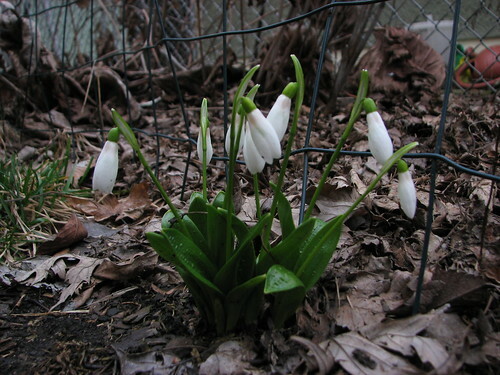 It's just so nice to see something blooming outdoors, isn't it? Dare we proclaim that spring is actually here? Enjoyed your post on the Chicago Flower Show so much! It's so interesting to see all the different perspectives of people attending the show; now I realize I missed several parts of the "Alice" display. But I agree with you on some of the other exhibits, because many of the same elements caught me eye. Your blooms aren't as large as your neighbors, but that doesn't make it any less impressive. Heck, at least you have something blooming. I've still got a couple of weeks to go before my bulbs do anything.